Sunday at the Palm Beach Boat Show! 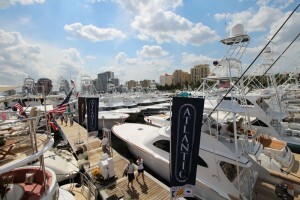 : Atlantic Yacht & Ship, Inc.
Its a beautiful Sunday at the Palm Beach Boat Show and Atlantic Yacht & Ship is getting ready for the weekend with 19 yachts on display and our in-water reception barge for clients. The 31st Annual Palm Beach International Boat Show, March 17 – 20, 2016, is one of the top five boat shows in the country – featuring more than $1.2 billion worth of boats, yachts and accessories from the world’s leading marine manufacturers. It is truly an International Show. The event includes hundreds of Boats from 8 foot inflatables, power boats, fishing boats, center consoles, bow riders, personal watercraft to superyachts over 150’. 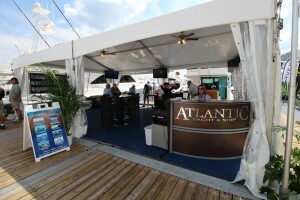 The finest pre-owned yachts, tents full of the latest electronics and accessories, seminars and kids fishing clinics. Exotic cars, live music and fun for all. Show entrances will be located at Evernia St./Flagler Dr. (waterfront) and North Clematis St./Flagler Dr. (waterfront). Admission to the show costs $21 for adults and $11 for children, although you can purchase tickets online in advance and you will receive a discount, or contact your favorite Atlantic Yacht & Ship broker! For more information on this 2016 Palm Beach Boat Show be sure to contact Atlantic Yacht & Ship today or come by at the show and say “hello”!